Designed with elegance, the DXL heavy duty binder solves the common problem of overhanging top-loading sheet protectors and index tabs with patented construction. Tested for comfortability by U.S. Ergonomics and awarded the Comfort Certification. Easily houses oversized indexes and sheet protectors. The Soft Click™ rings open with one handed easy motion. D-Ring holds up to 25% more sheets. Designed for comfort, a professional look and oversized function. Stronger hinge for constant use; created with a special ribbed seal. Contains at least 40% post-consumer recycled content. Made in the USA by Samsill. Nonstick clear overlay material on front, back and spine is environmentally friendly and will not stick or lift copy from cover inserts or contents. Fast reference label holders instead of overlays. 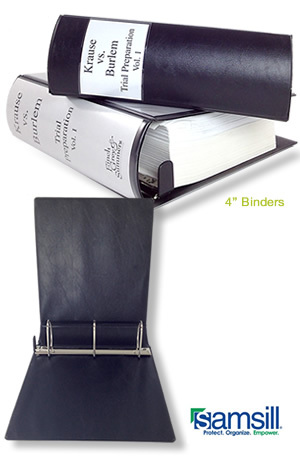 Ring binders for your filing needs! Prestigious presentation binders with 24k gold lettering on the spine. Make a lasting impression on your clients. 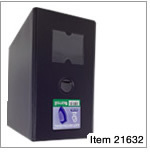 Use with letter-size paper and standard 2-hole punches. Large selection of corporate binders.